This week's Friday News Digest is coming to you from Tulsa, OK, where the city's mayor has decided to unilaterally remove from plans a sidewalk along Riverside Drive leading to "A Gathering Place for Tulsa" -- a world-class park under construction and valued at more than $350 million, the largest gift to a public park in U.S. history. The park is expected to draw more than one million visitors per year, some of whom may wish to walk to the park without long detours or crossing a dangerous stroad. Four former Tulsa mayors support the sidewalk construction, but not the current one. Of all the possible reasons the mayor could use to hide the real reason the sidewalk is being removed, he has chosen to cite "pedestrian safety." — Tulsa Mayor, Dewey Bartlett, Jr. Sounds like the problem is with the stroad and not the sidewalk, Mr. Mayor. An appropriate solution to keeping people safe as they make their way to the Gathering Place -- a place designed for people to, um, gather -- never involves removing the people. At least not in a strong town. No word yet if the mayor is planning to remove the multitude of existing sidewalks around the city that are adjacent to stroads with speeds 35 mph and higher, you know, "for safety." 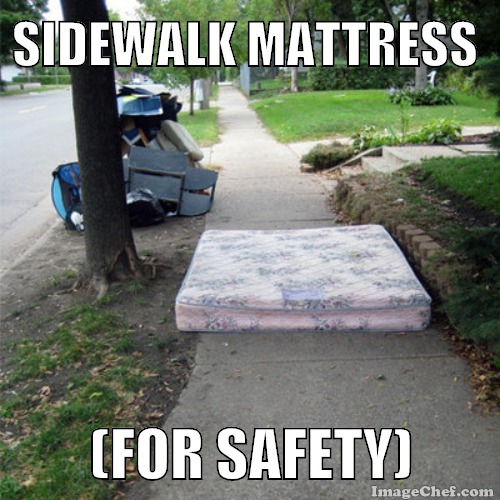 The mayor's approach to pedestrian safety is nearly as effective as these sidewalk memes highlighted by Bill Lindeke on Streets.mn. Of course, safety is being used as a distraction to the real issue with which neighbors are concerned: park-goers parking in front of their houses. This fear leads some to develop the strange assumption that sidewalks can't exist on their own without parking lots. Perhaps some of those people are coming from their homes. Some might choose to walk because their families might be among those contributing to the decline of two-car households, a category KPMG auto industry analysts predict could shrink to 43% by 2040. We can't move on to other news without showing you this cringeworthy video from the neighbors who oppose the sidewalk. The neighbors somehow have managed to use the lack of sidewalks on their own neighborhood streets as an argument for opposing the Gathering Place sidewalk on the arterial stroad that is Riverside Drive. The whole video is worth a watch, if only because it's such a train wreck, but skip to 04:10 to see what caused laughter to erupt from the capacity crowd of sidewalk supporters at a recent town hall meeting. Unfortunately, overwhelming support for the sidewalk at the town hall meeting did not dissuade the mayor from waiting until the park is built to decide whether to add the sidewalk. In other news, smaller cargo vehicles like the Nissan NV200, Ford Transit, Chevy City Express, and the Mercedes-Benz Sprinter could have a major impact on the way streets are designed in cities. If 15 and 20-foot models become the norm, there will be no excuse for the large curb radii that enable high speed turns in complex city environments. Designing intersections for the most vulnerable street user instead of the largest possible vehicle could really go a long way "for safety." In Lakewood, OH nearly everyone walks to school. The school district has never bought a single school bus. The city resisted the temptation to build new schools on cheap land on the periphery and instead focused on restoring and upgrading existing multistory school buildings on relatively small lots that already fit neatly into the community. The result? Gigantic savings on transportation costs that can be funneled toward what matters most: education. Strong Towns contributor Jesse Bailey from Walkable West Palm Beach recapped last week's #blackfridayparking event, describing why it's so important to shed light on the ways government imposed minimum parking requirements are so destructive to the financial resilience of cities everywhere. It's impossible not to think of Andrew Price's Fine Grained Strong Towns blog post from Monday while reading this Next City piece on what street vendors can teach us about how urban space works. We need more capitalists and diverse ownership of capital to build strong towns. Too often cities do far more to hurt the creation of capitalists than they do to encourage it. Great cities are incubators of capitalism for everyone -- not just those already at the top -- and, therefore, have a fine grained economy. Now, Target might not be considered fine grained, but the retailer is working to fit into the urban fabric by packing itself into a smaller box. At 20,000 square feet, TargetExpress stores will compete in the urban pharmacy/convenience market and is a strategic move to better serve rising urban populations. You'd think after spending tons of money capping a freeway and talks of ripping out another, Dallas wouldn't even dream of strangling its downtown with yet another expressway. Nonetheless, leaders are pushing for a fifth downtown highway in the form of the $1.5 billion Trinity Toll Road located between downtown and the river in a flood plain. By now, Strong Towns readers have likely seen the graphs showing state DOT traffic projections missing the mark badly year after year. The presence of flat or declining vehicle miles traveled per capita presents an interesting question: Does the "induced demand" theory that we can't build our way out of congestion still ring true if we've hit peak VMT? If a new-found ability to build our way out of congestion actually exists, that presents another set of questions: should we? Does the math work? Lastly, this week the New York Times showcased every Strong Towns reader's favorite subsidized stadium arena transformation punching bag that is the Memphis Pyramid's conversion to Bass Pro Shops at the Pyramid. A megachurch and the Smithsonian were candidates for the vacant structure. But the Pyramid will now be home to 535,000 square feet of the "candy store of the great outdoors." Some of the locals have mixed feelings about this move. That's it for this week's digest. 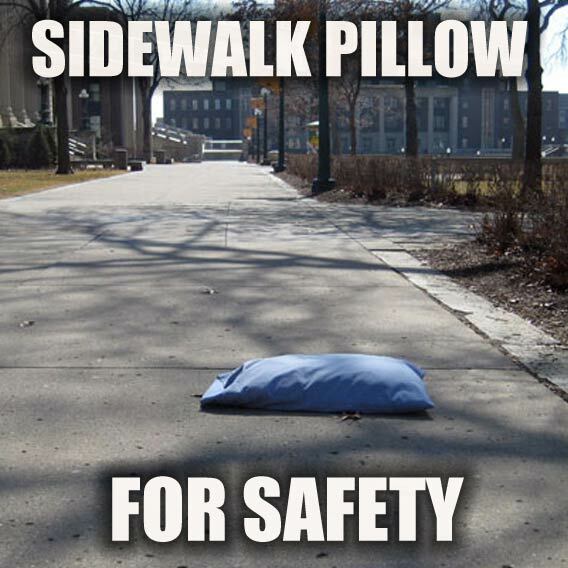 Keep doing what you can to build Strong Towns, you know, "for safety."